He has been an excellent leader of the party and has the qualities to make a great Taoiseach but the electorate have fixed in their minds a view of him that is inaccurate, not based on his performance and even at times simply unfair. Yet it would seem that a large portion of them are not for shifting in this view. It would appear that the public has decided that Enda is the soccer guy who clears out the dead wood, sets up the youth academy, brings through new young players and buys well even wins a few cups but having done all that just can’t seem to connect with them and the squad he has assembled in order to win the league. 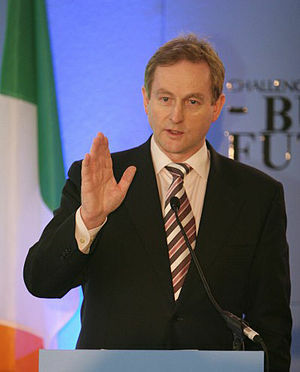 It’s frustrating and undeserved for Enda Kenny but I think that if the government wins the confidence motion next Tuesday that we as a party should immediately make a smooth transition to a new leader in the form of Richard Bruton and look over the course of the summer to iron out a deal with the Greens that transitions them out of government ASAP. Offer them 3 Taoiseach’s nominee seats in the next Seanad for 3 of their TDs that lose their seats to let them recover as a party in opposition (we’re going to win the Seanad elections anyway with a minimal amount of cllr discipline) and we could look at implementing some of the outstanding Green policies from the PfG that aren’t that awful. A properly constituted directly elected Mayor for Dublin isn’t a bad idea, nor is reform of the planning system. What the poll shows is our problem that FG are obviously not getting the party’s message across well enough. I get quite annoyed at some of our spokespeople for the their inability to get across a cohesive and consistent narrative of what a vote for FG would mean and what the change that would result from a FG win would be like. Enda Kenny’s leadership isn’t separate from that but nor it is the whole story. The rise in Labour’s support is quite impressive for what it is but also very interesting for what it isn’t. It’s not an endorsement of Labour’s policies because they don’t have any. They have a series of well expressed if ill defined goals but not detailed policies to achieve them. I think the truly massive implication from this poll and other recent ones is that the electorate are hugely volatile. FF have lost the faith of the public and neither FG nor Labour or SF have 100% convinced them to date otherwise Labour would have been over 30% much earlier. There are a lot of voters who are open to listening to a new message and it would seem they are taste testing at the moment. And we should take our lucky stars that we don’t have a rabid party of the right looking for scapegoats amongst racial minorities or minority sections of society. What this poll does prove once and for all is the folly of many left leaning people in their desire to get FG off the pitch so that a real left/right contest could emerge. It has always been the fact that FF were on Labour’s territory that prevented that sort of contest coming about. Should FG change leader? I don’t believe so but the question is now will FG change leader? I think it is more possible than it was 6 months ago. There won’t be any movement (with that I’ve probably just damned Enda’s chances of staying on) on the FG leadership this side of the no confidence motion. After all it is entirely possible for McDaid and McGuinness to go walk about, for Lowry to decline to support Cowen (anyone miss his Oxegen ticket give-away?) and Jackie to fail to make the train up from Kerry. And were that to happen all bets are off. For now though it looks to me like the End has started. This entry was posted in enda kenny and tagged Add new tag, enda kenny, Fianna Fail, fine gael, irish politics, irish times, labour, leadership challenge, mrbi, politics, Richard Bruton, Taoiseach. Bookmark the permalink.